Donald Judd’s Chinati Foundation, the minimalist museum he created out of an abandoned fort, has transformed Marfa. Problem is, the old sheds were never designed to house artworks. 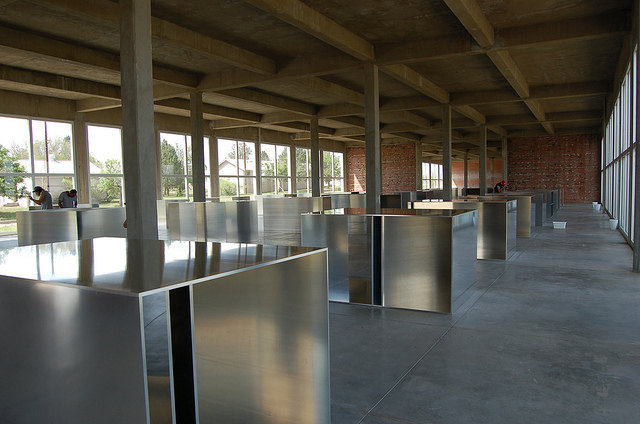 Released yesterday, the new list of 67 sites includes the Chinati Foundation, the art museum created by the late sculptor Donald Judd just outside Marfa, Texas. Chinati opened to the public in 1989, and it now houses works by other minimalist artists, including Dan Flavin — works that unite the barren West Texas desert and the abandoned artillery sheds of what once was a military base, Fort A. D. Russell. There’s a stark purity to the combination that’s unlike any other ‘art installation’ in the world, and the mix of ‘cowboys and quirky culturati’ that Chinati has attracted has won Marfa international stature. But the Chinati buildings were never created to preserve artworks, and the World Monuments Fund cites the “deteriorated state” of the campus. Even routine repairs have become complicated, leaving the artworks endangered. Ironically, coming up is Chinati Weekend — a two-day series of screenings, talks, exhibitions and a benefit dinner for the foundation. The only Texas site previously put on the Monuments Watch List was what remains of Route 66 in the Panhandle.